This week we were challenged with setting our goals for Yoga MOOC – truth be told, I didn’t watch the entire goal video. I’m good at setting small manageable goals as well as longer term stretch goals. My goal for YogaMOOC is to try everything at least once. I’m working my way through the videos, 5 minutes at a time. You see, my computer is setup to kick me off every 30 minutes – enforcing a minimum 5 minute break. That lets me do yoga MOOC in those breaks (as well as other chores like going the dishes and making coffee). When I find something that works, I keep it. When I don’t, I move on to the next thing. One of the surprising things that is working for me is the short mindfulness meditation exercise (this video – https://youtu.be/Ui5RA6AYZVQ). I find myself more focused and more at peace after doing it. So, I’ve added that in as a regular break. The first time I did it, I was challenged because I did not anticipate the pause in the audio. I was laying down with my eyes closed focusing on the tip of my nose and all of a sudden the sound went off – no more background noise – I thought the video had stopped playing, so I opened my eyes to take a look. I’d recommend that whatever the background noise is, that it be kept, so that it is an obvious intentional break in the speaking, and not a failure of the video to load (the joys of tech). The breathing video was particularly challenging (add to the didn’t work for me pile), because it had people laying on their stomach. Fortunately, I discovered this at a yoga retreat that I attended that I need to address breathing differently. My previous yoga training (prior to cancer surgery) had already taught me to stomach breathing (diaphragmatic breath). My chest surgery caused me to use diaphragmatic breathing as a default, but also caused me to not to fill the top of my lungs when I breath – so instead of feeling my stomach when doing breathing exercises, I actually need to practice feeling my chest expand. I also have a lack of feeling in both my chest and stomach, so laying on the mat on my stomach doesn’t help me. I need to use my hands to help determine where my breathing is happening. When I lay on my back with my hands on my stomach, I can feel where the breath is coming from. I’ve taken a photo of my step (sorry cannot get a selfie of me in it, I’ll try get remember to get my hubby to take a photo). 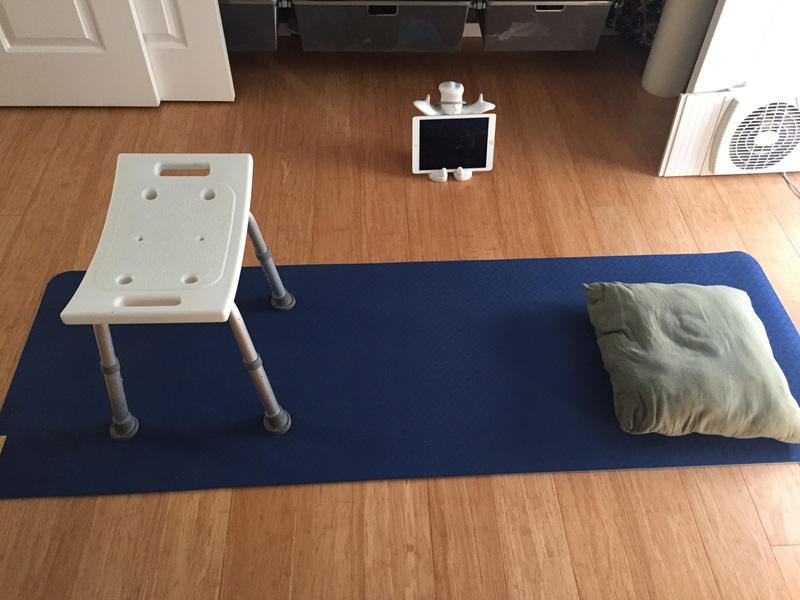 I put my legs up no the shower stool (it makes a great leg rest for yoga – which I only discovered yesterday!). I have a small pillow for my head as my yoga mat isn’t overly thick/soft. Also notice that I have my iPad with a chef stand to the side. Here I can play the videos while in position. I find this works really well for the meditation. I’m not yet sold on the body scan – but I’ll try that again tomorrow and see if is something that I’ll keep. I’ll definitely keep the mindfulness meditation practice. Now for the off the mat mini-checkin (https://youtu.be/t_n3n9UrQM8), I’ve decided to reenable the breath notifications on my Apple Watch. I’ve set it to ask me every 3 hours to breath. It is a one minute break where it walks you through taking deep breaths. I can use that time to step back and reflect on how I’m feeling at the moment. Asking myself how my back is doing (I have lower back pain issues)? How much energy do I have? Am I hungry? Am I being productive at my computer or is my mind just wondering? Is it time to get out and do some exercise? So far, I’m enjoying Yoga MOOC – http://yogamooc.com/ – and I’m hoping it will translate to me being more productive with my dissertation work! I had the same experience when the audio stopped. Kept peeking over to see if the video was still running. So good to connect & read along your journey. So Courageous! Thank You for Sharing.